Polka dots first became popular in the 1850s when the polka dance was popular. This classic pattern has made its way into the crocheting world so with Polka Dot Patterns for Crochet Afghans you'll be able to incorporate these playful spots and dots into your crocheting. Classic and fun, polka dots also offer surprising variety in shape, size, and color. You're sure to find a crochet afghan pattern with polka dots that would fit your home decor. From crochet baby blankets, to afghans, to polka dot crochet motifs, this collection will have you feeling just dotty with inspiration. Learn how to crochet polka dots to spice things up. You should do a little polka dance, because you just found the cutest polka dotted patterns around! If you like polka dots, maybe you'll like another familiar shape. 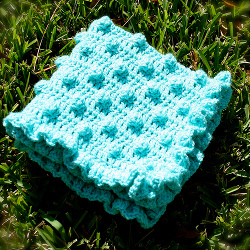 Check out our free eBook, 11 Granny Square Crochet Patterns for Square Crochet Projects. If you can't decide what type of baby blanket to crochet, this list of free patterns is sure to help. Polka dot patterns are very versatile, making them perfect for both boys and girls. Some of these baby blanket patterns for crochet are great for using up scrap yarn too. Stick to crochet polka dot patterns to make crochet baby blankets that everyone will love. Who says polka dots are just for kids? These patterns for crochet afghans are great for the young-at-heart. Featuring inspiring circle crochet patterns and cute little spots, these polka dot patterns are super chic. Can't get enough round stuff? Check out 8 Round Crochet Afghan Patterns. So you love polka dots, but you want some freedom in your crochet design? These Crochet granny squares are the perfect solution. 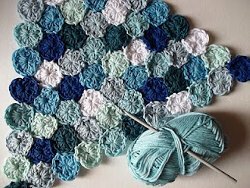 Arrange these spotted squares in a polka dot pattern and use basic granny squares to fill in the gaps. 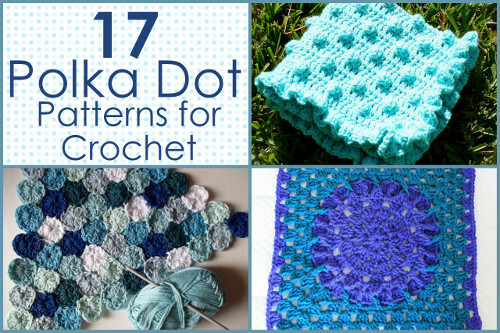 You'll have a lovely polka dotted crochet afghan in no time!